It’s been one year since I’ve been a full-time blogger. I work about 2 hours a day, sometimes 4 if I’m lucky, 4 days a week. I spend plenty of time with my 1.5 and 3.5 year old girls and my wife stays happy with me being home all day, while she works on her business. She’s also able to buy pretty much anything she wants. How am I able to work so little, spend time with my family, travel, and live stress-free? Can your blog survive without a sales funnel? Yes, but only .001% of blogs on the internet are making REAL money with ads, sponsored posts, and affiliate marketing. If you sell anything via your blog (services, physical products, digital products, affiliate products, etc.) then you already have some sort of funnel. If you want to turn your readers, browsers, or followers into raving buying fans and customers, you need to have a system in place. And that system starts with your sales funnel or sales funnel. I have great news for you if that’s something you’re struggling with or thinking. Every blogger thinks the Holy Grail of a successful blog is traffic. And technically, they are right. Without traffic, your blog will die a slow and painful death. The beauty about adding sales funnels to your blog is you can make significant money with very little traffic if you have a high quality sales funnel in place. You don’t need to have millions of visitors a month or spend tons of money on advertising to get enough traffic to make an impact. There are plenty of free ways to generate traffic: guest blogging, Pinterest marketing, social media marketing, etc. However, one of my favorite strategies for driving traffic into funnels is Facebook advertising. This is where you’re sending the traffic you’ve worked so hard for. You want to, NEED to collect an email address so you can keep marketing to people who you’ve impressed or helped. You’ve built a little bit of trust, now it’s time to lay in on thick. Offer your reader something of VALUE. Something that will help them achieve a desired result. Create what’s referred to as a “lead magnet” that is valuable and actionable. Within your landing page, you’ll ask for an email address in exchange for your lead magnet. In order to have a successful blog on autopilot you need some type of email marketing provider, such as Actionetics, Getresponse, Aweber. This is one of my favorite parts of the sales funnel: the autoresponder. This is where you take autopilot to another level. Making sales while you sleep. The fact is, a VERY small percentage of your audience and visitors will buy from you right away. It could take up to 9 “touches” or engagements to convince, persuade, or motivate someone to buy something from you. The end result of a good sales funnel is asking for and making a $ALE! This one is pretty straight-forward, you create and market yourself to make money, so a good sales funnel, makes a sale. ClickFunnels makes making sales really easy, since you can create stunning websites, high-converting landing pages, and awesome looking order forms. Now that you know the flow of a good sales funnel, let’s get more specific. Believe it or not I just ONE of the above funnels to make $10,000 every month. Funnel #2. If you decide to try ClickFunnels for 14-Days I’m going to give you $997 worth of bonuses just for signing up under my affiliate link. My bonuses include how to create and profit with a digital product in 12 weeks or less, a 1-on-1 call, and a ClickFunnels Success Course. 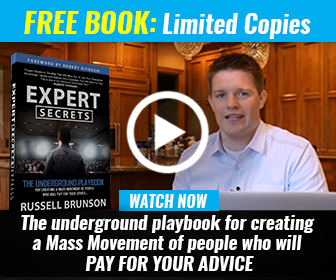 Once you do, just email me at nick@bloggingwithfunnels.com and I’ll send you a link with the bonuses.